The right tools for the next run. 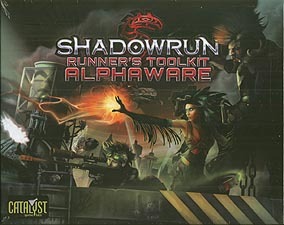 Do you play Shadowrun now, and are you looking for a set of tools that'll allow you to easily introduce new gamers to your favourite RPG at your local game store or hangout? Say yes to any of those? The Runner's Toolkit: Alphaware is the box set for you. Designed as the perfect stepping-stone between the Shadowrun Beginner Box and Shadowrun, Fifth Edition, this box can fill a number of roles. Whether you're looking for more adventures and options to move beyond the Beginner Box, laying the groundwork for your gaming group to move fully onto Shadowrun, Fifth Edition, or providing adventures, maps, and other tools to use in conjunction with the core rulebook, you'll find this kit invaluable. Rules of the Street: A rulebook designed to be accessible and simple to use. The Edge of Now gives the flavour and background of the Sixth World. Plots and Paydata: Adventures and tips for any Shadowrun gamemaster. Spell, weapon, and gear cards for quick reference. Pre-generated characters players can use right away. A double-sided poster. North America map and killer art. And of course, handfuls of six-sided dice for Shadowrun action.